Waitse keng... 2016 is almost over so let's just concede and call it Somizi Mhlongo's year. This year the entertainer has truly reached the pinnacle of his fame despite over 20 years in the business. TV show spots, MCing gigs, endorsements, Somgaga has been raking them in this year and he has just bagged another one. Organised by the grand dame socialite of Mzansi, Ms Edith Venter, Cell C Playing for Pink Ladies Invitational Polo Event will once again grace the fields of the Inanda Club in Sandton on Sunday, 2 October 2016. 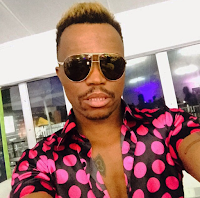 Somizi and tv personality Maps Maponyane have been chosen as the male ambassadors for the event and initiative, which will see celebrities, socialites, sports personalities and the fashion forward descending on the Inanda Club grounds for a day of pampering, high fashion and the thrill of the adrenaline-fueled polo match line-up, with all teams comprised solely of female players. Cell C Playing for Pink Ladies Invitational Polo Event takes place at the Inanda Club in Sandton on Sunday, 2 October. Tickets are available at TicketPro.